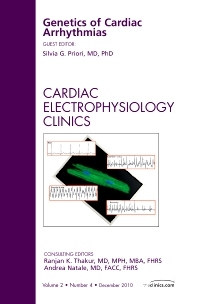 This issue reviews the genetic basis of several heart rhythm disturbances, focusing on information that is relevant for the clinician. Among the conditions included are Brugada syndrome (in an article written by Dr. Brugada), atrial fibrillation, hypertrophic cardiomyopathy, arrhythmogenic right ventricular cardiomyopathy, and sick sinus syndrome. The issue concludes with a consideration of the potential for genetic testing for cardiac arrhythmias.